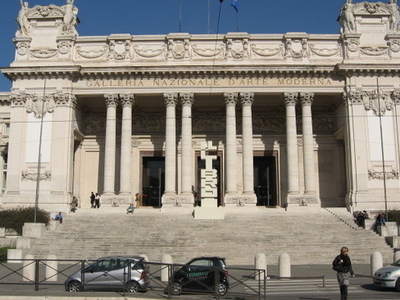 The Galleria Nazionale d'Arte Moderna (GNAM), or National Gallery of Modern Art, is an art gallery in Rome, Italy, founded in 1883 and dedicated to modern and contemporary art; the full name is Galleria nazionale d'arte moderna e contemporanea. It is located at Via delle Belle Arti, 113, near the Etruscan Museum. With its neoclassical and Romantic paintings and sculptures, it marks a dramatic change from the glories of the Renaissance and ancient Rome. Its 75 rooms house the largest collection of works by 19th- and 20th-century Italian artists including Giuseppe Ferrari, Giacomo Balla, Umberto Boccioni, Giorgio de Chirico, Giovanni Fattori, Amedeo Modigliani, Giorgio Morandi, Giacomo Manzù, Alberto Burri, Antonio Canova, Felice Casorati and Lucio Fontana. There are also a few notable works by foreign artists, including Calder, Cézanne, Duchamp, Giacometti, Braque, Degas, Kandinsky, Mondrian, Kostabi, Monet, Jackson Pollock, Rodin, Van Gogh and Klein. Here's the our members favorite photos of "Galleries in Rome". Upload your photo of Galleria Nazionale d'Arte Moderna!